On January 23, 1963 during a very cold winter, a tank holding 3 million gallons of soybean oil in Mankato, Minnesota ruptured and flooded the streets, eventually making its way to the Mississippi River. In the spring, more than 10,000 ducks were found dead in the wetlands along the river. Soybean oil accounts for about 80% of all the vegetable oils and animal fats (lard, butter, etc.) consumed in the U.S. each year. In 1920 there were only about 500,000 acres of soybeans planted in the U.S. In 1940, there were about 10 million acres of soybeans, in 1970 about 40 million acres and in 2007 about 70 million acres of soybeans were planted. Soybean oil is the most widely used vegetable oil. There are even soy crayons crayons which are safer to use, brighter in color, and less expensive to produce than petroleum wax crayons. One acre of soybeans can produce 82,368 crayons. In 2005, 87% of the U.S. soybean acreage was planted with Genetically Modified Seed. The Chinese have known the medicinal properties of fermented products for thousands of years. They have been using moldy soybean curds to treat skin infections for over 3000 years. Soybeans were first domesticated in China in about the 11th century BC. The U.S. produced 84 million metric tons of soybeans in 2005, which was 37.9% of the world production of 222 million tons. 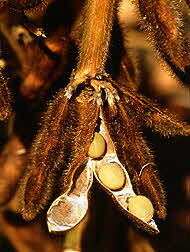 The world's largest producer of soybeans is the U.S. with more than 1.5 million bushels each year. The majority is used for livestock feed. Soybeans are planted on almost 60 million acres of land in the U.S., and the U.S. grows about 2/3 of the world's soybeans. Almost 98% of the soybeans grown in the U.S. are commercial type, and only 2% are vegetable types. Soybeans are the largest cash crop in Missouri.